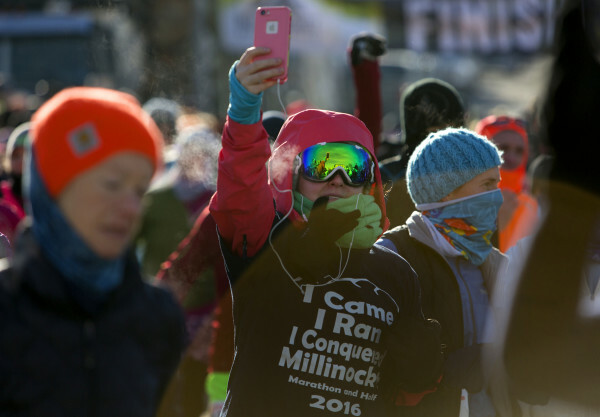 A runner captures the moment of running through downtown Millinocket during the second Millinocket Marathon and Half Saturday. The free race drew hundreds of people to the town. 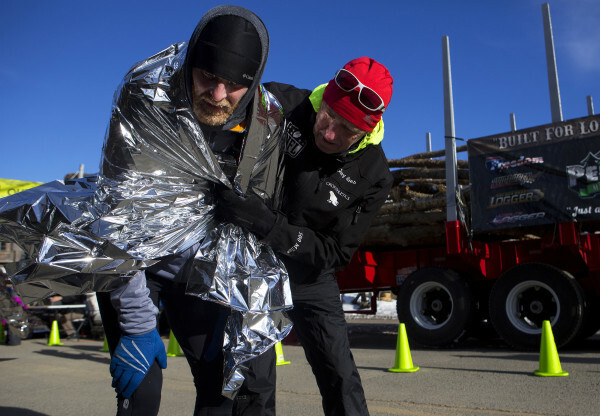 Gary Allen (right) wraps a space blanket around Aaron Long after Long finished the half marathon during the second Millinocket Marathon and Half Saturday. The free race drew hundreds of people to the town. Marathon runners make their way through downtown Millinocket for the start of the second Millinocket Marathon and Half Saturday. The free race drew hundreds of people to the town. 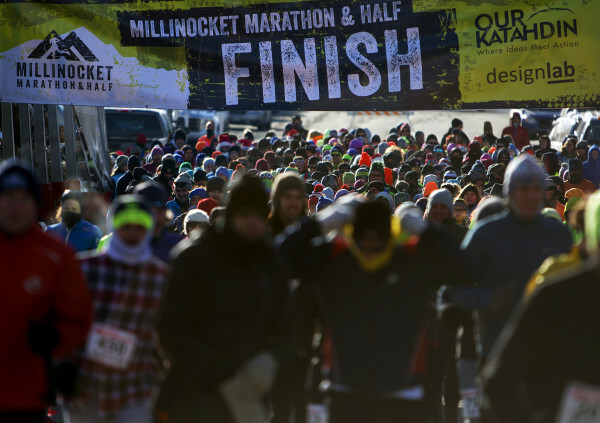 Half marathon runners wait for the start of the second Millinocket Marathon and Half Saturday. The free race drew hundreds of people to the town. Gary Allen (left) talks with half marathon runners before the start of the second Millinocket Marathon and Half Saturday. The free race drew hundreds of people to the town. 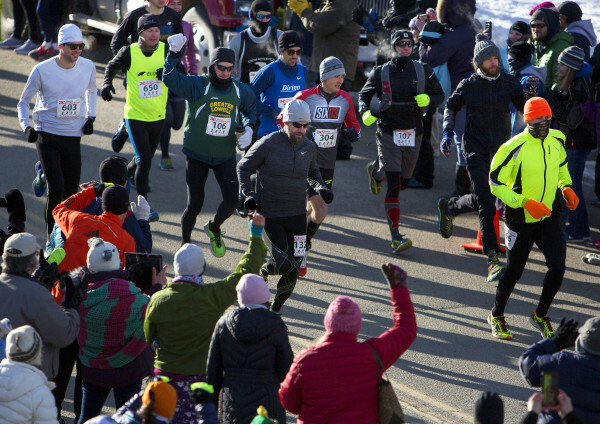 Half marathon runners make their way through downtown during the Millinocket Marathon and Half Saturday. The free race drew hundreds of people to the town. 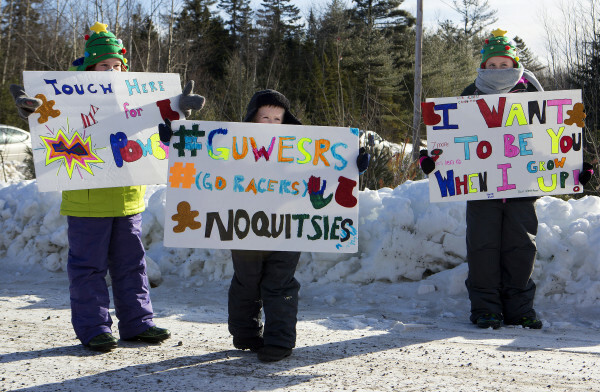 Tarynn Pollman (from left), 9, James Emerson, 5, and Kennedy Emerson, 10, hold up signs cheering on runners on the Golden Road during the second Millinocket Marathon and Half Saturday. The free race drew hundreds of people to the town. 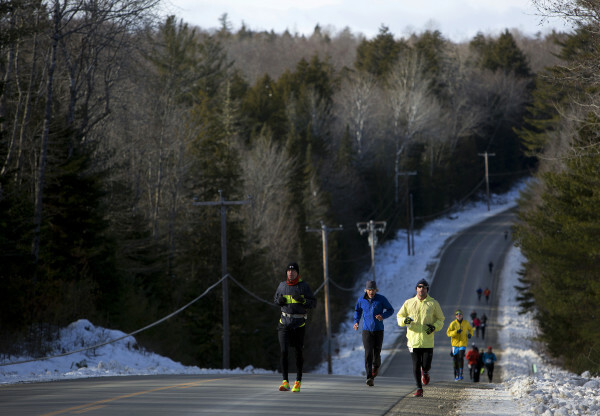 Runners run up a hill during the second Millinocket Marathon and Half Saturday. The free race drew hundreds of people to the town. With icicles in his beard, Aaron Long talks with Gary Allen after Long finished the half marathon during the second Millinocket Marathon and Half Saturday. The free race drew hundreds of people to the town. 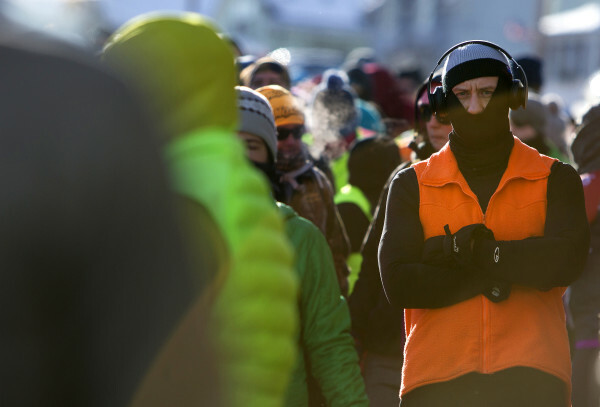 A runner tries to stay warm before the start of the half marathon during the second second Millinocket Marathon and Half Saturday. The free race drew hundreds of people to the town. Half marathon runners make their way through downtown Millinocket for the start of the second Millinocket Marathon and Half Saturday. The free race drew hundreds of people to the town. 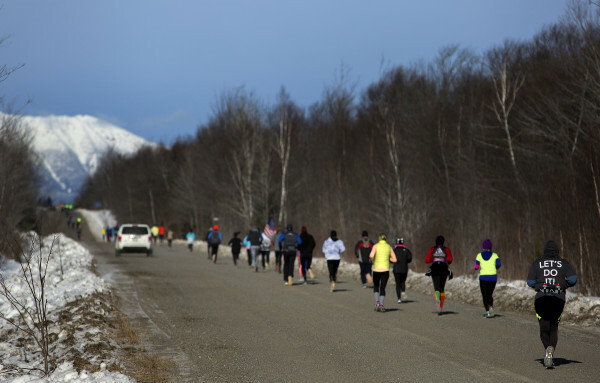 Runners make their way on the Golden Road during the second Millinocket Marathon and Half Saturday. The free race drew hundreds of people to the town. 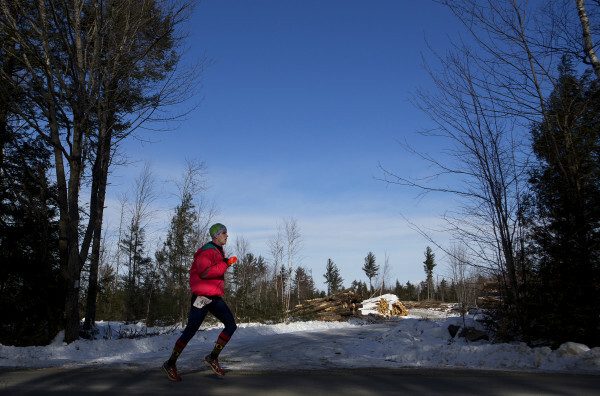 Runner Ryan Collins of Portland was the first full marathoner to cross the finish line in the Millinocket marathon, finishing in 2:45:57 to win his first marathon. 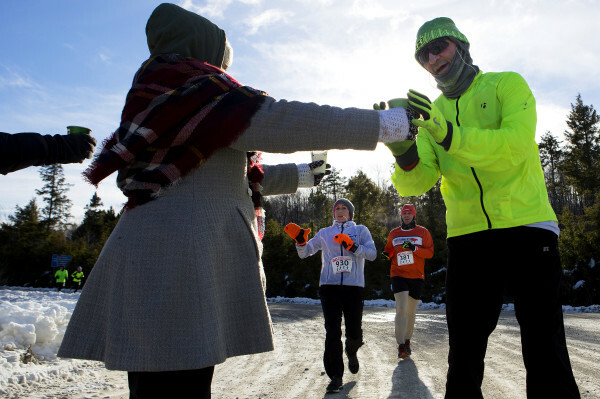 MILLINOCKET, Maine — About 550 runners endured bone-chilling cold Saturday to run the second annual Millinocket Marathon and Half. 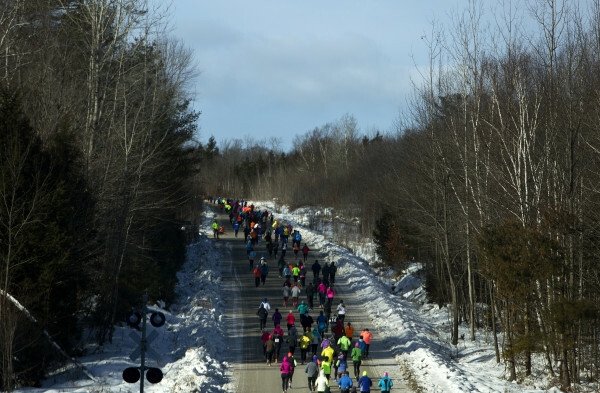 Conditions, runners said, were so cold that icicles formed on backs and necks. At least 10 runners dropped out due to the weather. 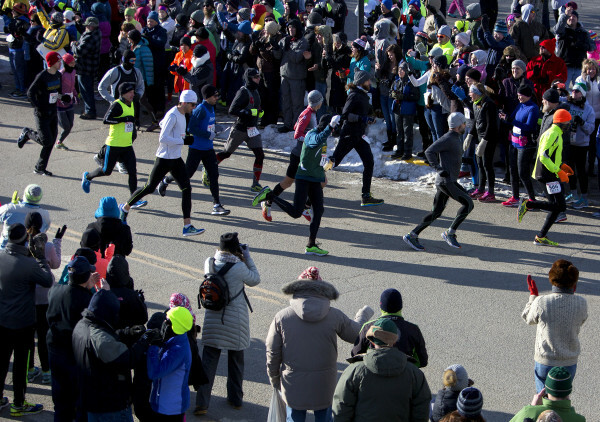 The only thing more improbable than running 26.2 miles in stiff winds and the freezing temperatures, it seemed, was race winner Ryan Collins. 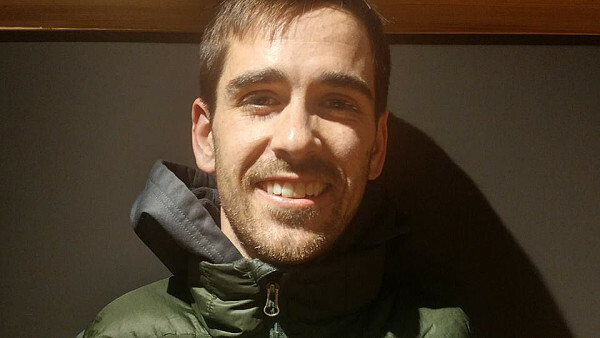 Collins defeated Mainer Matt Garfield and two-time U.S. Track and Field Association Ultra Runner of the Year Michael Wardian, finishing in 2:45:57 to win his first marathon. 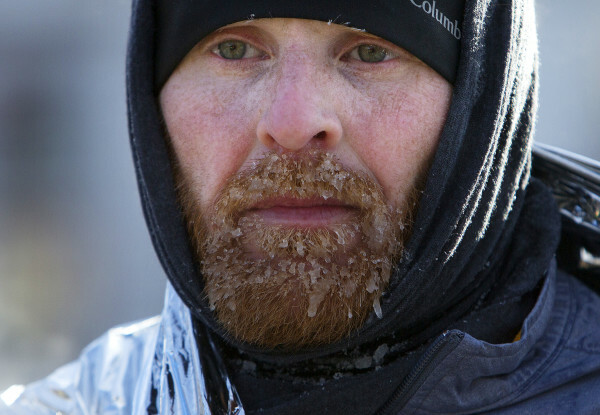 He crossed the finish line with an icicle of sweat hanging from his chin. Someone had to tell Collins it was there because he couldn’t feel it, he said. 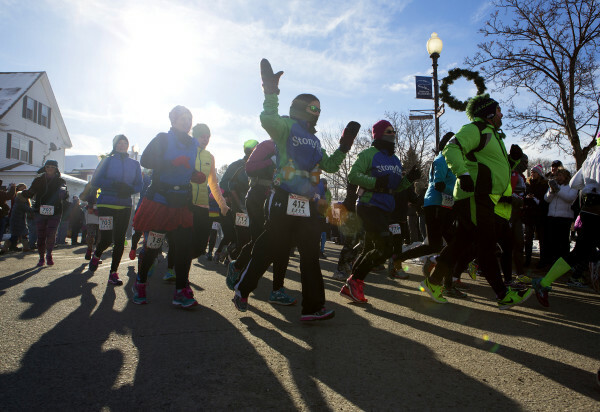 “For the first four or five miles my toes were numb. After that I was just aware that it was so cold. It was a factor that was constantly there that you had to deal with,” Collins, 31, of Portland said. 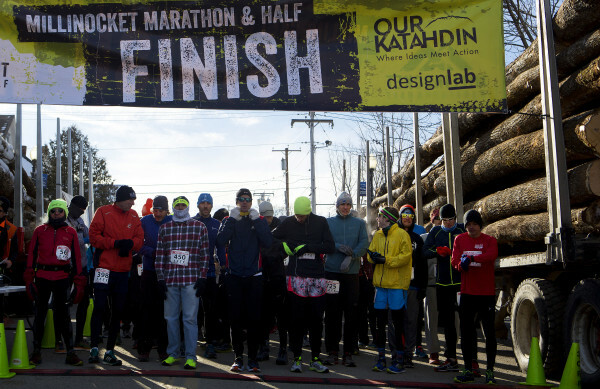 Maine marathoner Gary Allen, who organized the event last year as a community pride and economic development effort for the Katahdin region, estimated about 1,500 people attended. 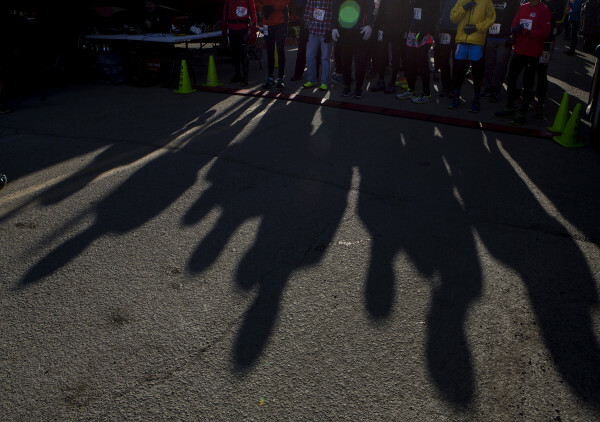 About 953 runners had pre-registered runners as of Wednesday, but some dropped out likely due to the weather, he said. 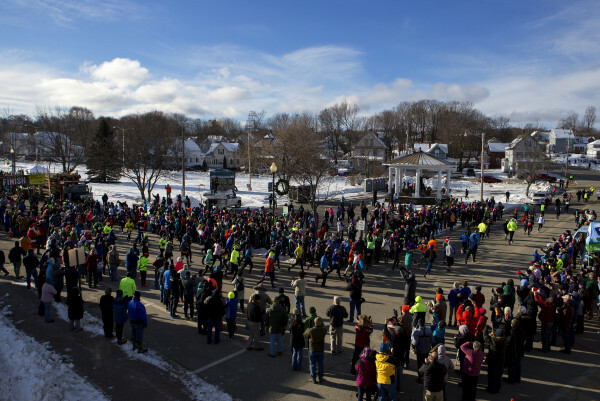 The founder and of the Mount Desert Island Marathon and a Cranberry Isles resident, Allen waived entrance fees to the Millinocket races but encouraged runners to come here and spend freely. His goal: to help the region recover from two mill closures that have devastated the region’s economy. At least some racers were honoring Allen’s request. Racer Kim Jones, a 46-year-old who said she came from Chicago to participate, estimated her personal spending at about $225 as of race time. Annemarie Heisler, 46, of Portland said she spent $190. Deborah Giroux, 51, of Falmouth, Massachusetts, spent $250, and Mary Newell, 66, of New Haven, Connecticut, said she spent $200. Those numbers gibe with figures provided by Sheila Brennan Nee, strategic director of the Maine Sports Commission. Nee said national estimates place typical, individual spending at $129 to $200 per person for an event of Millinocket’s size. Vehicles lined Penobscot Avenue and several nearby streets. Angelo’s Pizza Grille owner Gene Shields said his business was up 40 percent since Thursday. The Scootic Inn was full as of 5 p.m. and so was River Driver’s Restaurant at 9 p.m. One bartender at the Scootic said she made more than $200 in tips Saturday. Maine Heritage Timber made sales despite not finishing renovations to its Penobscot Avenue storefront. Maine Heritage, which had close to 200 visitors on Saturday, set up its products temporarily to take advantage of the event, manager Jamie Bouchard, 29, of Millinocket said. The largest hotel in Millinocket, the 76-room Katahdin Inn & Suites, reported booking all of them for the weekend. 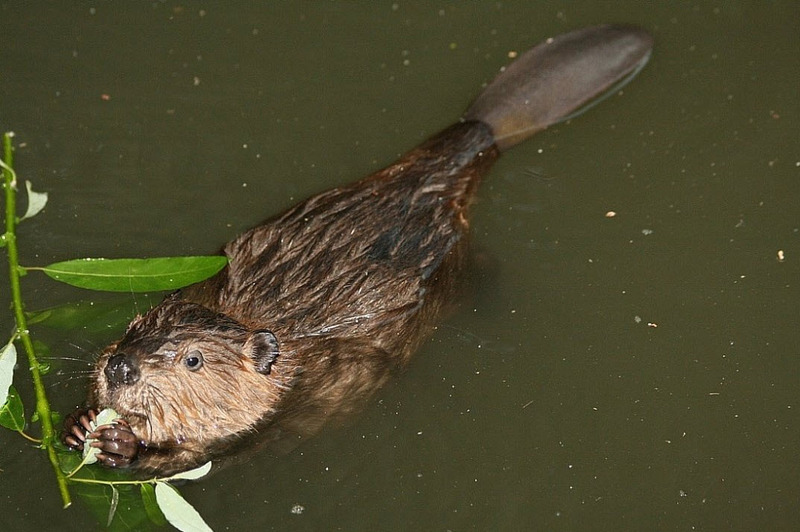 The Town Council awarded Allen a plaque declaring him an Honorary Native Son, said Jessica Masse, whose Designlab marketing and graphic design firm helped publicize the event. Stearns High School hosted the runners registration, artisan fair, a spaghetti dinner, variety show, children’s fun day and Maine Short Film Festival. More than 40 Katahdin region businesses offered in-store discounts and raffled off prizes this weekend and about a dozen organizations held spaghetti dinners and other events. Yet, the support townspeople offered runners was the most impressive thing to Wardian, who holds the Guinness Book of World Record mark for running all the Abbott World Marathon majors in one year. 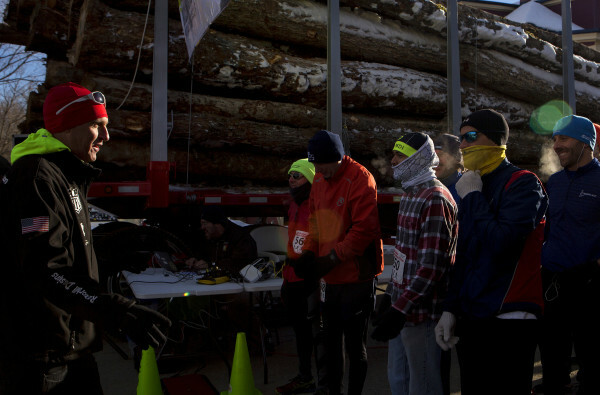 Collins said he was impressed by the Millinocket touches added to the race, such as the start and finish line being between two half-loaded logging trucks. “It was incredible to see people out there cheering us all the way. There were people standing out in [the cold] wind chill handing us water,” Wardian said. Some runners used the race as a chance to come home. 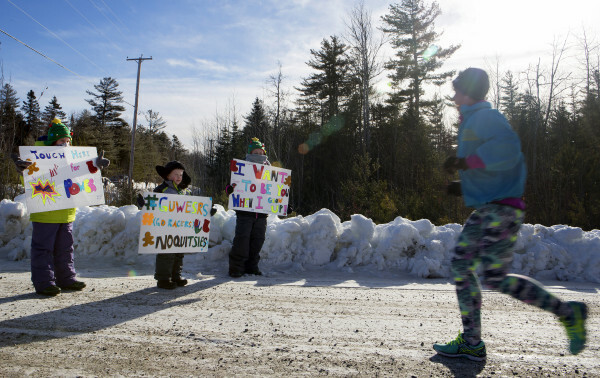 Amanda St. Peter, a 37-year-old surgical tech who lives in Gray, warmed up in her mother’s Millinocket Floral Shop after finishing the half-marathon. “I am surprised at how many family friends I saw out there cheering us,” St. Peter said. The cold shut down her cellphone. 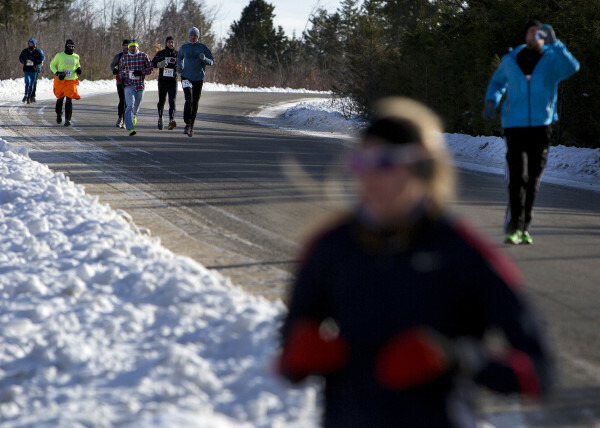 St. Peter and other runners said the hardest part of the course was the agonizingly long gradual uphill of the Golden Road, where the winds blew coldest. “It was probably minus-1 degrees out there then,” she said. Allen, the organizer, said he looked forward to next year’s event. For full race results, visit 3C Race Productions’ website at 3craceproductions.com.